FERNWOOD RECORDS - In 1955, Memphis was buzzing with the fresh and exciting sounds emanating from Sam Phillips' Sun Record Company with artists as diverse as Johnny Cash, Elvis Presley, Carl Perkins, Billy Emerson, Rosco Gordon, Slim Rhodes and Little Milton. In those days, Memphis was a Music Centre that generated those great rarities, excitement, feeling and excellence, and there were plenty of other entrepreneurs standing in the wings hoping to pick up a piece of Sam Phillips' action. One of them, Ronald ''Slim'' Wallace was born February 28, 1922, in Paragould, Arkansas, Ronald Wallace grew up during the hard times of the Great Depression. Slim served in the Civilian Conservation Corps and the United States Navy. After the war he supported his family as a truck driver, but his love of music led him to open a night club in Paragould. Slim’s Cotton Club drew talented musicians from across the Delta. Billy Lee Riley from Newport, Arkansas, and Jack Clement and Glenn Honeycutt from Mississippi played there, and all three joined Slim in forming a western swing band called the Dixie Ramblers, a hot western swing outfit, based in Memphis and resident at Slim's club, 90 miles outside Memphis in Arkansas. 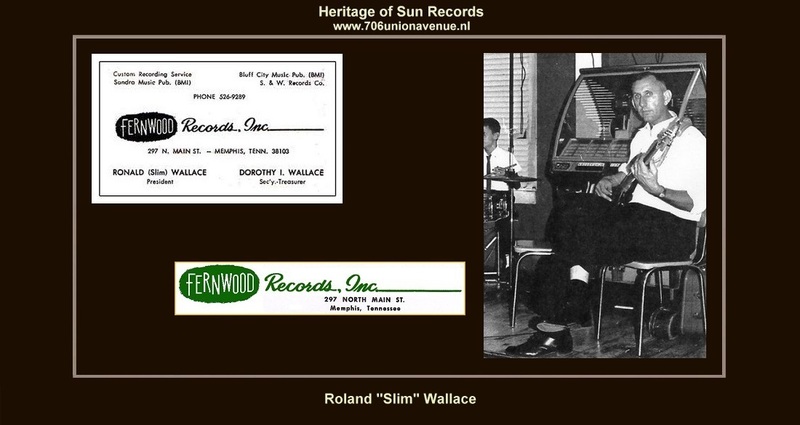 Ronald ''Slim'' Wallace could see Memphis was going to become a music center, so in 1955 he moved his family to 152 Fernwood Drive and turned the garage behind the family home into a record studio and record label, Fernwood Records. Born in Whitehaven, Memphis on April 5, 1931, Jack Clement's musical pedigree first reared it's head, after he had been discharged from the Marines in 1952, when he joined up with Buzz Busby as Buzz and Jack The Bayou Boys, playing bluegrass around the Boston area. Jack was featured playing acoustic guitar, mandolin and steel. Jack returned to Memphis, joined Slim's band and, having observed the success of Sun records, formed a partnership with Slim to create Fernwood Records, operating out of Slim's garage on Fernwood Drive. Noticing Billy Riley's obvious talent, Slim and Jack elected to cut their first single with Riley in Slim's garage on an old Magnacord tape recorder that had been bought from Memphis disc jockey Sleepy-Eyed John. Things did not go so well initially, so they rented WMPS studio to achieve the desired sound on ''Trouble Bound''/''Rock With Me Baby', destined to be Fernwood 101. The unissued title ''Think Before You Go'' was recorded at the same session. Jack took the tape to be mastered at Sam Phillips' Sun studio, where Sam liked the tape so much that he offered Riley a Sun recording contract and Jack Clement a job at the Studio. The result was the exit of Riley and Clement to Sun leaving Slim Wallace to soldier on. So Slim turned to another one of his band vocalists, Ramon Maupin to record Fernwood 101 ''No Chance''/''Love Gone''. Maupin was a Memphis based singer, songwriter and musician, who worked for several years in Slim's band and was also to become associated musically with Charlie Feathers. While Fernwood 101 had strident hillbilly overtones, which excited Slim enough into pressing a rare 78 of the release, sales were not rewarding and it would be 2 years before Ramon would appear again on Fernwood 105 with the riotous ''Rocking' Rufus'' /''What's The Use'' by which time Scotty Moore and his 'crew' had taken over studio production. Ramon remained active until the early 1970's, but sadly died in the 1980's, his considerable talent, mostly unrewarded. Slim was surprised by the lack of sales on his first release and sat back a while to ''recharge his batteries'', returning with quite some potential clout in the shape of Scotty Moore, who had left Elvis Presley along with Bill Black and D.J. Fontana. Scotty was made Vice-President of Fernwood and studio producer, as it was felt that Scotty was more attuned to recording rock and roll and general pop of the time. The first production was the very unusual Fernwood 102 of ''Knock Down, Drag Out' by Buford Peek, who was the main vocalist of that moment with Jimmy Haggett's Band. The fusion of rockabilly with western swing continued on the Bside ''Wishing'', where Buford almost croons over the western swing feel, which then breaks into a fine hillbilly guitar solo. The highly talented Travis Wammack, all of 13 years old, made his recording debut at this point on Fernwood 103. With his unbroken voice, he roars through ''Rock 'N' Roll Blues''/''I'm Leavin' Today'' very ably supported by Eddie Bond's Stompers with notable contributions from another guitar prodigy, Reggie Young, and Smokey Joe Baugh on piano. Unknown until now is the fact that it was Eddie Bond, who was instrumental in arranging that first Wammack recording contract with Slim Wallace and it was Eddie again, who would use Travis on Shows to give him his first taste of working in front of an audience. Travis Wammack would later develop into a fine guitarist and vocalist, who would scratch the charts a little later, with his fine record of ''Scratchy''. Clyde Leoppard ran one of the most consistently popular bands in the Memphis area and it was in 1958 that he was featuring a local singer called Eddie Collins. Collins had the classic Memphis locale hillbilly voice, which he used to great effect on Fernwood 104 ''Patience Baby''/''Can't Face Life Alone''. At the same session, Collins recorded his most commercial effort in ''I've Been Around Too Long'', which was to be issued on El-Rio 414 using ''Patience Baby'' as the B-side. Thomas Wayne Perkins, brother of Luther Perkins, Johnny Cash's famous understated lead guitarist was born in Batesville, Mississippi on July 22, 1940 and duly attended Humes High School, where he formed a vocal group with three girls, Nancy Reed, Sandra Brown and Carol Moss, to play High School Hops with a very young Lincoln ''Chips'' Moman on guitar. Chips Moman wrote the classic ''This Time'', later to be a hit for Troy Shondell, but the original was put together by Thomas, Chips and the Girls, now called, the De-Lons. With the blistering ''You're The One That Done It'', written by Ray Scott of ''Flying Saucer Rock 'N' Roll Fame'', on the other side, Fernwood 106 had all the making of a hit, to the extent that, Mercury Records licensed the master from Fernwood and tried their luck with it, as well, sadly to no avail. Thomas Wayne would eventually produce Fernwood's biggest and only hit with the teenaged balled ''Tragedy'', which will be included on the next Fernwood CD along with the rest of the Thomas Wayne story. At this point, with Duane Eddy riding high in the charts, Scotty Moore produced his only Fernwood single ''Have Guitar Will Travel''/''Rest'' on Fernwood 107. This excellent instrumental had the benefit of some beefy back-up form Bill Black and D. J. Fontana, but sadly did not crack the charts. Books have been written about Scotty Moore, Bill Black and D. J. Fontana on their time with Elvis Presley and their subsequent importance in the world of rock and roll, but here Scotty was firmly ensconced as Vice-President of Fernwood and hitting his stride as an excellent producer with Bill Black and D.J. Fontana helping out with session work. The King's Band had much to do with those early Fernwood Sessions. It was around this time that a musical lawyer named Bob Buckalew was brought in to strengthen the team. Fernwood was certainly releasing some great singles and a legal mind was felt necessary to add weight to the team. As Fernwood was only a few months away from the massive hit ''Tragedy'', this turned out to be a wise move. Fernwood 121 boasted the talents of Bill Reeder, another native of Memphis, with his excellent single ''You're My Baby''/''Where Were You Last Night''. With a definite nod in the direction of Buddy Knox and the Rhythm Orchids, ''You're My Baby'' almost captures that easy rolling Texas feel. Reeder later recorded for Vol-Para out of Paragould, Arkansas and then for sides for Hi including tasty versions of the Teddy Redell song ''Judy'' and ''Till I Waltz Again With You''. Reeder was still playing clubs into the 1980's, but, he had opted for the more profitable and comfortable life of selling insurance. Sadly he died from a heart attack earlier this year. Fernwood 124 produced that rare single in rockabilly/rock and roll, a novelty single that works. About Alvin Holland and Bill Bennett nothing seems to be known, but their one-off single is truly a gem with Piano and drumstick working together to crate the typewriter effect of ''Typing Jive''. Slim Wallace was quite an entrepreneur and, along, one suspects, with some advice from Bob Buckalew, tried his hand at releasing singles on various Fernwood subsidiary labels such as Pure Gold/Bootheel/El Rio/Mid South/S. & W./Whirl A Way, the latter being controlled by Slim's wife. Some stunning singles were released, but, sadly again without any real chart success. El Rio 413 by Eldon Rice has to be one of the best double sides from those far off rockin' days with both ''Don't Let Love Break Your Heart''/''Our Love Won't Die'' steaming along helped by some truly blistering guitar work from Roland Janes. Both titles were written by Mary Louise Black, who would later become Mary Louise Rice. In 1963, Eldon and Mary were living in Carrier Mills, Illinois, where Mary landed a new songwriting contract with Santo Music. Another one-off artist was Doug Clayton, who breezed into Memphis in 1963 to make his classic single ''Saturday Night Twist''/''Sally Ann'', which Slim released on Pure Gold 300. Despite it's ''Twist'' title, this was simply a good old fashioned Memphis rocker with some more excellent guitar work. Nothing is known about Doug, except that he probably rode off into the Memphis Sunset clutching his piece of Pure Gold, which it certainly is. Probably in 1964, Slim set up Whirl A Way Records, apparently as some form of Tax Haven for his wife. The records were pressed and there seems to have been no promotion for any of them. Indeed, at the time of writing only 4 singles have so far been discovered, while the catalogue numbering indicates at least nine. Paul Sullivan's ''Juke Joint Boogie'' is one of the Whirl A Way rarities, which has become a Club favourite over the years. Incredibly, it was released as late as December 1965, sounding like it had been made in 1957. It seems safe to say that Beatlemania and the British Invasion never touched Fernwood or it's satellites! Although, by 1959, Fernwood was clearly making every attempt to be a commercial label, it seems that Slim Wallace could not resist releasing a couple of superb, yet wonderfully outdated, Country singles on a very short lived Fernwood country series. Both singles were by Willie Phelps and both were excellent. Featured here are ''D.J's Jamboree''/''Yes Siree, Yes Siree'' from Fernwood FW-45-1 and 45-2 respectively. ''Yes Siree'' is notable for some fine guitar work. Sadly Willie's wonderful warbling seems to have attracted little attention and the country series seems to have quietly faded away along with Willie. Interestingly, Slim appears to have set up a Fernwood Music subsidiary in Norfolk, Virginia, where the first Willie Phelps Fernwood single was re-issued utilising the original matrix with a new label. This Fernwood Music satellite was also to provide a home for ''Grandpa's Rock'' by the Trail Blazers and the incredible 45 by Gene Criss ''Hep Cat Baby''/''I Don't Know'. Cees Klop of Collector Records spoke to Gene Criss at least 25 years ago and it seems that this classic was a home recording made in a 'kitchen with an extremely limited pressing run. Gene apparently only performed locally for a very short time in a bar and then retired to become a gardener. Properly mastered for the first time, this has to be one of the greatest rockabilly 45's ever released. instrumental breaks, while ''Rosalie'' is very unusual in that Shelby is almost crooning the lyrics interspersed with some tough and very lengthy guitar breaks. Another fine Smitty 45 came courtesy of Virgle Baker with '''I Satisfied'' (Sic)/''That's All You Do''. This excellent double sider turned up in the Fernwood files and this must be it's first release since the original 45 in 1960. Virgle recorded a number of sides for various Memphis labels, notably for Marshall Ellis of Erwin and Zone records. Jimmy & James and the Tempos appear to have committed themselves to wax on just one occasion sometime in 1960 with the very tasty ''No Kisses Have I''/''The Moon Will Shine'', which they had pressed on Dora 123. This well produced double sided rocker came courtesy of Cees Klop, who raved about if for a long time, before the Fernwood deal was cemented. Thomas Mitchell also seems to have recorded his marvellous '''I'm A Wise Old Cat'' sometime in 1960. Immensely popular on the European club scene, this track has been 'bootlegged' on a number of occasions. It's a steaming rocker in the best Memphis tradition with great instrumental breaks. Issued on Flash records, Thomas Mitchell seems to have been just that, a flash in time, Two Minutes and Fifteen Seconds of Rockabilly Heaven and gone! We do know that Thomas came from Shreveport, Louisiana, played the Hayride and made one tasty 45 for Mercury ''Little Mama''/''Jukebox Help Me Find My Baby'. Finally we come to a couple of riotous rockers previously unreleased that turned up on some tapes provided by Robert Louers. As noted Jack Clement had spent time playing bluegrass music with Buzz Busby, but it seems that Buzz had a notion to move in on the burgeoning rock and roll scene and persuaded Jack to record him on a gasping and breathless rocker called ''Rock 'N' Roll Fever''. Buzz sounds like certainly has fever, as he howls his way through this amazing piece of of nostalgia. Buzz never quite made it in rock and roll and soon returned to bluegrass, although he did work with his brother Wayne recording the wonderful ''Live Your Life With Care'' for Empire Records. Shown as being by Little Louis Robertson, the wonderfully high spirited ''I'm Gonna Rock'' has to be an unreleased recording by Travis Wammack from that 1958 Fernwood session. No question, Travis means the Title and delivers with Gusto. Fernwood Records operated on and off until 1968, when a flood destroyed tapes and stock at their headquarters on 297 North Main Street. The following year, the same Wayne McGinnis, who had recorded one startlingly good single for Meteor in 1956. A serious young student of Memphis music, Jim Cole, found Wayne and thanks to Jim, I was finally able to meet Wayne and arrange to acquire both Fernwood and Santo Records. For many years now, Sun, Meteor and Hi have been regarded as the main rock and roll/rockabilly/rhythm and blues labels in Memphis, but hopefully with this and other releases being planned, Fernwood will come to be regarded in the same way, in the future. Fernwood Records was dissolved during the aftermath of Slim’s daughter Sandra’s tragic death in 1976. Slim Wallace died in 2001 at the age of 79, but his musical legacy lives on. Over the years the rockabilly genre has enjoyed repeated revivals both in the United States and in Europe. Ronald Wallace also left a more personal legacy. His grandson Mark also is a musician who is dedicated to preserving the heritage of Fernwood and of his grandfather and the other musicians associated with that studio. SAVIOUR RECORDS - A subsidary of Fernwood Records, Memphis, Tennessee. SANTO RECORDS - A subsidary of Fernwood Records, Memphis, Tennessee. PURE GOLD RECORDS - A subsidary of Fernwood Records, Memphis, Tennessee. MID-SOUTH RECORDS - A subsidary of Fernwood Records, Memphis, Tennessee. EL-RIO RECORDS - Eldon Rice was a part owner of this subsidary of Fernwood Records, Memphis, Tennessee. BOOT HEEL RECORDS - A subsidary of Fernwood Records, Memphis, Tennessee. WHIRL-A-WAY RECORDS - Owner Dorothy & Ronnie Wallace. A subsidary of Fernwood Records, Memphis, Tennessee.